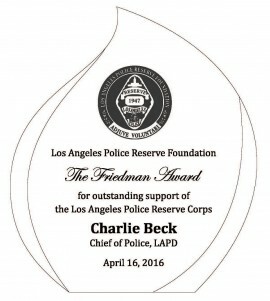 During the annual Twice A Citizen Awards on Saturday, April 16, 2016, Los Angeles Reserve Police Foundation Co-Presidents Karla Ahmanson and Michael Sellars presented the Foundation’s Friedman Award to Los Angeles Police of Police Charlie Beck. The Friedman Award is named after a long-time LAPD Reserve Officer who also served on the LAPRF Board for 15 years. The Award is given to those who go “above and beyond” in supporting the LAPD Reserve Corps. Chief Beck started his law enforcement career as a reserve officer over 40 years ago. In leadership roles throughout his career, he has been a steadfast supporter of the Corps. As Chief of Police, his leadership has lead to a reinvigorated reserve program. The annual banquet honors members of the LAPD Reserve Corps, awards the Reserve Officers of the Year, and raises much-needed funds for the program. This year’s banquet was held at the Avalon Hollywood. The Twice A Citizen/Community Leader honoree was Kent McCord of the classic television show, Adam 12. The evening was co-hosted by Patricia Heaton and Robert Hays.